Sometimes We Feel More Comfortable Talking To A Robot : All Tech Considered Artist Alexander Reben wants to know whether a robot could fulfill our deep need for companionship. He created a robot named BlabDroid that asks people to share their raw emotions and deep secrets. We spend a lot of time talking to Alexa and Siri. Imagine if such artificial personalities were put inside a cute, adorable robot. That's what Alexander Reben has done. The artist created what he saw as the perfect interview machine to see how much he could get people to reveal to the robot. 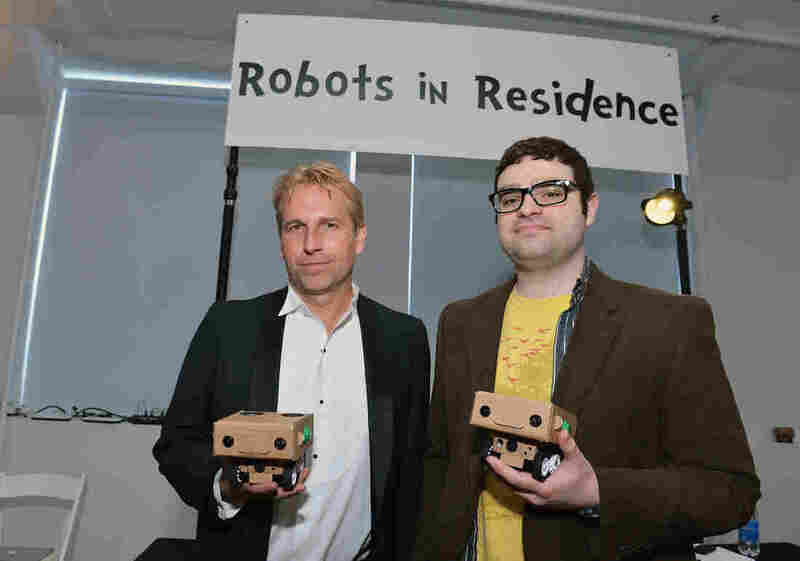 Reben's experiments with human robot interactions began when he was working on his master's degree in robotics at MIT. He built a robot called Boxie. It was made of cardboard, about the size of a microwave oven, and rolled around like a toy tank. If you walked into the lab at MIT, Boxie would approach with its big, round black eyes wide open and ask you for help getting upstairs or going down the hall. Reben wanted to see how many people would help the robot. He wondered, could you build cheaper robots without legs that could get around with help from humans? But, one day, something happened that would change the course of Reben's work. It started with a man walking into the lab and Boxie rolling up to greet him. "I saw him from a distance, laying on the carpet in the middle of the lab talking to this robot on the ground," Reben says. The man began to share his troubles with Boxie. He had never been to Boston before and he'd come to take part in the marathon. The man "just started talking to this thing like it was another person," Reben says. The man told the robot that he was supposed to go to Munich, but his flight was canceled because of a volcanic eruption in Iceland. The conversation was a revelation for Reben. He realized that the characteristics that made people want to help Boxie also seduced them into talking with the robot. After all, it was cute and seemed vulnerable. Reben teamed up with another artist and filmmaker, Brent Hoff, to see whether they could design a robot that would make people want to open up. They carved a smile into its face. "It's the perfect smile. It's kind of a Mona Lisa smile," Hoff says. "It's open and engaging to make sure [it] was as nonjudgmental and nonthreatening as possible." They gave it the sweet voice of Hoff's 8-year-old son. And they taped him asking carefully chosen questions. "There was some consideration of what are the deepest, most important questions we have as people," Hoff says. It asked things like, "Who do you love most in the world?" or "If you could give someone any gift, what would it be?" And it had a camera and a recorder inside it to catch the answers. They called the new robot BlabDroid. "The idea," says Hoff, "is that there is not as much judgment in a robot asking you a question as a journalist" would. Hoff says he doesn't know for sure whether that's true, but he wanted to find out. And so did I. We set up a loose experiment. I would ask people the same questions as BlabDroid and — like the robot — there wouldn't be any follow-up questions. We tried the experiment a few times: once at an art opening and once at the Exploratorium, a science museum in San Francisco; we also listened to responses BlabDroid had collected at the Tribeca Film Festival in New York City. You can click on the audio below to listen to the two examples. Try to guess whether the person was talking to me or the robot before you read further. Nate Mazur: "She Makes This A Better World"
Judith Helfand: "I Would Give My Mother The Gift Of Not Worrying About Me"
The first one is Nate Mazur, who was asked, "Who do you love most in the world?" He replies, "My wife." Mazur opens up about the wonders of their relationship. He says he loves her most because of his "ability to be with her, to be present with her. To respond and interact. ... She makes this a better world," he says. The second example was Judith Helfand. She was asked, "If you could give someone any gift, what would it be?" She broke into tears as she spoke about her dying mother. "I would give my mother the gift of not worrying about me before she dies," Helfand says. "She wants me to lose a ton of weight and get really, really healthy. And she needs to see that before she dies ... and I wish I could give her that and I'm not positive I can." Both the answers are sincere and from the heart. Mazur spoke to me and Helfand was talking to BlabDroid. Helfand found something satisfying about talking to the machine. "The robot was just a means to get closer to myself at a really critical moment in my life," she says. It's been over two years since her mother died. Helfand lost the weight, but she is struggling with her career. She thinks the robot would be helpful. "Mediation really isn't really working for me," Helfand says. "I can't seem to find the courage to sit and write down what my future plans are so that I can make them really happen." I asked Sherry Turkle, a professor of science and technology at MIT, to listen to the responses. She couldn't tell whether people were talking to BlabDroid or me. Turkle has been studying human-machine relationships for decades. She says it really doesn't take much to get humans to open up to a robot. "We are kind of cheap dates," she says. BlabDroid — with its sweet voice, Mona Lisa smile and probing questions — is "pushing in us a kind of Darwinian button," Turkle says. She says robots don't even have to be cute. In her research she found a child who vented to Apple's Siri on an iPhone. Turkle says the child would vent on the phone about her anger toward her sister and her parents "because, in person, she tries to always play the good daughter." Turkle says over time, the child wasn't happy. "There was almost a feeling of abandonment," Turkle says. "There's no place they can go after they get the confession." 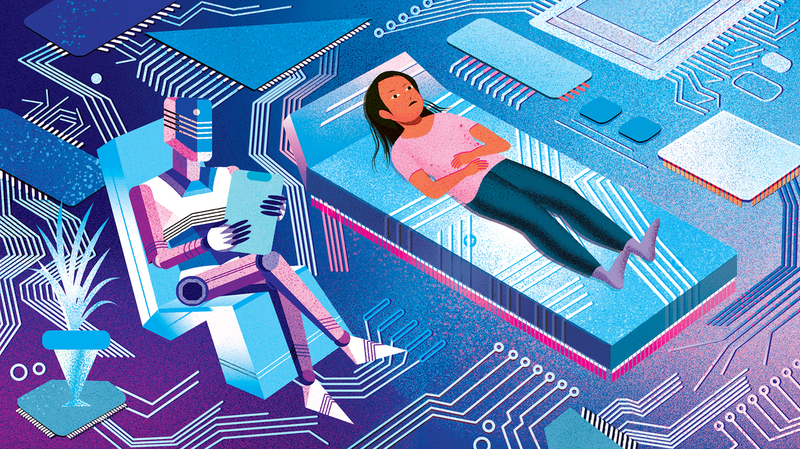 She says robots can't offer certain very human things — like care, conversation and empathy. "And the robot cannot do that because the robot has not had a life," she says. The science-fiction author William Gibson once said, "The future is already here; it's just not very evenly distributed yet." In Japan, robots are being used to care for the elderly. Men are having relationships with virtual women who exist only in a portable video game — even taking them out on dates. An American company has created robot bartenders. In the future, perhaps they will listen to our problems. Reben knows there is a downside to social robots. But he also sees a place for them in the future. He thinks a cute robot might do a better job of getting people to answer survey questions or talk about embarrassing symptoms before seeing a doctor. Reben says "people tend to be more honest because they don't feel embarrassed telling that to something that's not human." As an artist, what Reben hopes to accomplish with BlabDroid is to force us to think about the implications of bringing more robots into our society knowing full well that they are coming. In a previous version of this story, Brent Hoff's last name was misspelled as Huff. In addition, the story incorrectly said Alexander Reben's experiments began while he was working on his Ph.D. He was actually working on his master's at the time.